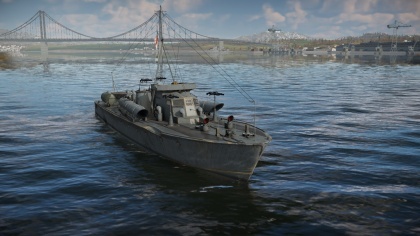 The MTB Vosper 1 series is a rank I British motor torpedo boat with a battle rating of 1.3 (AB/RB/SB). 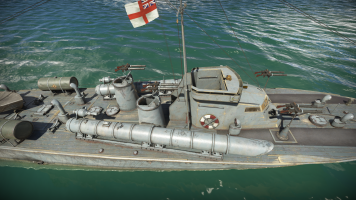 It was introduced in Update 1.83 "Masters of the Sea" as part of the British fleet closed beta test. Being constructed out of wood, the Vosper 1 has no armour and therefore must rely on manoeuvrability to survive. Areas to note is the engines located in the stern and the ammunition storage at the bow which makes it vulnerable to explosions. The crew consists of 10 men. Profile image of the Vosper 1 with x-ray enabled showing various internals. The engine bay lies in the stern with ammunition storage sitting under the bridge at the bow. As with any MTB the Vosper 1 is a fast craft being able to reach up to speeds at 64 km/h and then up to a further 104 km/h when fully upgraded. The time it takes to reach maximum speed of 104 km/h is 13.74 seconds and the time it takes to come to a complete halt is 15.49 seconds. Reverse speed goes up to 36 km/h once upgraded. Close shot of the Vosper 1 showing the turret placement. Note that the two turrets behind the bridge are offset to prevent obstructing from each another. This shot also shows the two angled torpedo tubes on the hull sides. Like the MTB-1, the Vosper 1 carries the same primary armament of eight 7.72 Lewis guns. However the largest difference is that is divided among four separate turrets with two guns each. Two turrets sit at the bow and the other two at the centre of the vessel just behind the bridge. With more crew manning the guns reload time takes ~9.5 seconds. The guns ammunition capacity sits at 960 with 7760 in storage. Being a light machine gun, the 7.7 calibre has relatively low range and power which is compensated by the amount of guns therefore it relies of volume of fire rather than stopping power. The general range that you should engage targets is within 1 km to maximise it's effectiveness and to avoid being out ranged by more powerful machine guns. Torpedo armaments consists of two 533mm Mk.VIII torpedoes with a range of 4.57 km at speed of 84 km/h. Each torpedo sits at bulwarks and are angled slightly so captains would need to rely on manoeuvring to aim them at longer ranges. Those who have piloted the MTB-1 should utilise the Vosper 1 in the same manner. 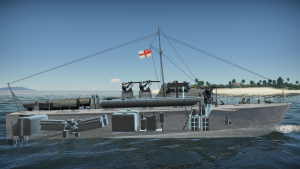 Despite appearances the Vosper 1 is functionally similar with the only noteworthy differences in that the Vosper 1 has slightly faster torpedoes and shorter reload times for it's primary armaments. 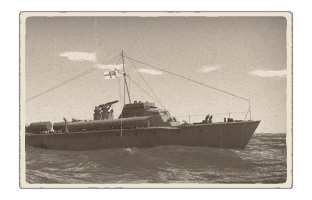 With no armour and high speed it is best suited to capturing points and ambushing larger ships with torpedoes or backing allied ships with smokescreen and anti-air cover as the low calibre of 7.72 Lewis guns is still effective on aircraft. Captains should generally avoid engaging enemy crafts longer than 1.5 km as the 7.7 calibre of the Lewis guns can be out ranged by larger calibres like the American .50 Cal or Russian 12.7 mm. Therefore it is recommended to attack in ranges less than 1 km in order to take advantage of the volume of fire whilst still retaining penetrative power. The torpedoes are also quite fast with good range which is useful against larger, slow moving vessels at distance. Vosper 2 series - Sister ship with front pair of Lewis machine gun armaments replaced with a 20 mm autocannon and a 12.7 mm heavy machine gun. This page was last edited on 7 April 2019, at 18:25.